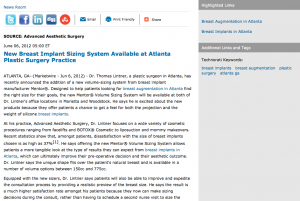 Atlanta, GA — Dr. Thomas Lintner, a plastic surgeon in Atlanta, has recently announced the addition of a new volume-sizing system from breast implant manufacturer Mentor®. Designed to help patients looking for breast augmentation in Atlanta find the right size for their goals, the new Mentor® Volume Sizing System will be available at both of Dr. Lintner’s office locations in Marietta and Woodstock. He says he is excited about the new products because they offer patients a chance to get a feel for both the projection and the weight of silicone breast implants. At his practice, Advanced Aesthetic Surgery, Dr. Lintner focuses on a wide variety of cosmetic procedures ranging from facelifts and BOTOX® Cosmetic to liposuction and mommy makeovers. Recent statistics show that, amongst patients, dissatisfaction with the size of breast implants chosen is as high as 37%, he says offering the new Mentor® Volume Sizing System allows patients a more tangible look at the type of results they can expect from breast implants in Atlanta, which can ultimately improve their pre-operative decision and their aesthetic outcome. Dr. Lintner says the unique shape fits over the patient’s natural breast and is available in a number of volume options between 150cc and 775cc. Equipped with the new sizers, Dr. Lintner says patients will also be able to improve and expedite the consultation process by providing a realistic preview of the breast size. He says the result is a much higher satisfaction rate amongst his patients because they now can make sizing decisions during the consult, rather than having to schedule a second nurse visit to size the breast using an older and less efficient method. “I am very confident in Mentor’s ability to continue making an exceptional product and I’m very glad to offer this option for sizing to our patients,” says Dr. Lintner. While the Mentor® sizers are a beneficial tool for helping patients choose the proper size implant, Dr. Lintner says the most important indicator of a successful outcome is the plastic surgeon’s ability and experience in performing the breast augmentation procedure. He says the ultimate choice of size or implant style should be made in the operating room using the patient’s anatomy, sizers, chest dimensions and the board-certified surgeon’s judgement. As with any medical procedure, Dr. Lintner suggests patients conduct extensive research before settling on a practice for their treatment. Through the expertise and surgical advice of a skilled plastic surgeon, he says patients have the opportunity to achieve a proportionate, beautiful result that can enhance their appearance and self-confidence. “I feel the new sizing system from Mentor will help communicate expectations between a prospective patient and myself and my staff. Clearer understanding of the weight and feel of any given size implant will help patients be happier with their post-surgical result,” says Dr. Lintner. An honors graduate of Georgetown University, Dr. Thomas Lintner earned his medical degree from Emory University School of Medicine, where he also completed his general surgery and plastic surgery residency programs. He is board-certified by the American Board of Plastic Surgery, a Fellow of the American College of Surgeons, and a member of the American Society of Plastic Surgeons, the American Society for Aesthetic Plastic Surgery, and several other professional organizations. Published in several articles and national journals of medicine and surgery, Dr. Lintner currently serves as an active member on staff at Wellstar Kennestone Hospital in the ER Services and Medical Staff Credentialing Committees. Advanced Aesthetic Surgery has two locations, both reachable at (770) 771-5151: 711 Canton Road Suite 400 in Marietta, GA, and 120 N. Medical Parkway Suite 200 in Woodstock, GA. It can also be contacted online via the websites tomlintnermd.com, atlantamommymakeover.com, or the Advanced Aesthetic Surgery Facebook page.